For those who’ve been to a Turnpike Troubadours show over the last year or two, or were somehow otherwise tuned into the throwback country soul of Charley Crockett through his first few self-released records, they need not be assuaged to the idea that he could be the next big thing in roots music. A direct descendant of American pioneer and Texas hero Davey Crockett, and of varied Jewish/White/Creole descent, Charley was instilled with the indelible mark of roots music when growing up in impoverished conditions in San Benito, Texas—also known as the hometown of Freddy Fender. Charley also spent his early years in Dallas with his single mother who was a blues singer, and an uncle who introduced him to the sounds of the French Quarter in New Orleans until he knew nothing different than banishing your heartbreak through song and story. In the years leading up to releasing his first album in 2015, Crockett spent time busking in New Orleans, New York City, traveled to the West Coast and even went to Europe and North Africa—the whole time perfecting his performance on the streets for spare change, and discovering a sound inferred by his rich roots background. Charley Crockett recently signed to Thirty Tigers, and somewhere in the offing you can expect a new, national debut album full of original songs from Crockett’s repertoire. 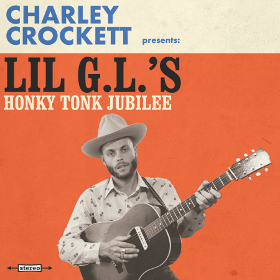 But in the interim, Charley has decided to take a take a step back from his own music to pay some dues and respects, and pay the songs of his country music heroes forward to a new generation in a record called Charley Crockett presents Lil G.L’s Honky Tonk Jubilee. A collection of songs from Hank Williams, Ernest Tubb, Loretta Lynn, Tanya Tucker, Roy Acuff, Webb Pierce, and others, the 16 tracks of the album find Charley Crockett interpreting timeless compositions with such love, you would have thought they were his own. Not just your average traditional covers album, the Honky Tonk Jubilee is Charley building a country music foundation, and proving his studious discipline and appreciation for the past greats before he ventures to contribute his own compositions to the American songbook in earnest. Though the songs might be familiar, it’s Charlie Crockett’s signature voice that makes the compositions come alive anew. 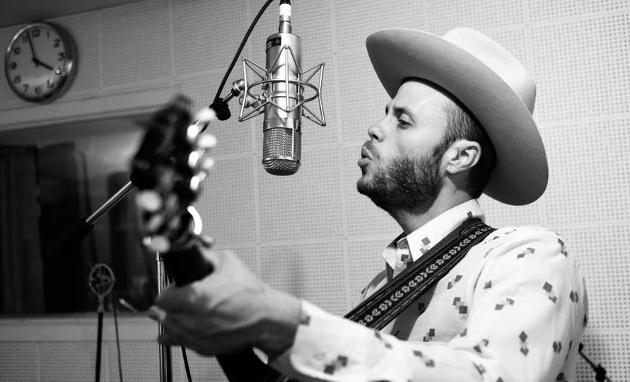 Heretofore, Charley Crockett has been thought of just as much as a blues singer as a country one, but in Honky Tonk Jubilee he draws lines between America’s roots cousins and proves they’re not as different as some would like to think. And even though you’ll hear the New Orleans influence in his voice, and especially in the album’s first track, “Night Train to Memphis,” Honky Tonk Jubilee is doggedly traditional country. Honky Tonk Jubilee was recorded in Austin, TX, and was co-produced by Crockett with Billy Horton. It will be released via Thirty Tigers on September 8th, but Saving Country Music readers can listen to the record a week early below. Charley Crockett will also be embarking on the Honky Tonk Jubilee Tour as part of the release, including a CD Release Show at the American Legion in Nashville on Tuesday, September 12th. 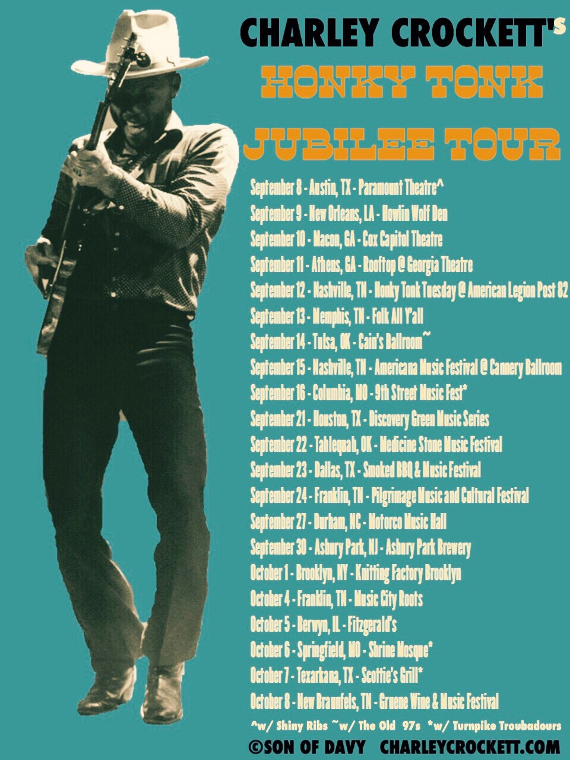 See full dates for the Honky Tonk Jubilee tour below. Saw Charley open for BJ Barham back in May. He’s a fine gentleman and put on a great show, and I picked up his record “In the Night” at the show. Looking forward to this release. Off topic but i just wanna send a big hug from Italy to all you guys in Texas and Louisiana. Hope everything is fine for you and your families. Thank you, Daniele. I live in Orange County, Texas, and when we were rescued on Wednesday morning, we had taken in 4 feet of water. It still has not gone down due to the releasing of the flood gates at the reservoir north of us. Sorry to hear about that Bertox. Are you and your family safe? I know your a regular here, see your comments all the time. I hope you have flood insurance. No, probably not with this album.It’s difficult to do covers of so well know artist. Hank Williams in particular…Does anyone remember Doug Seeger? In may this year he recorded an album with Hank William’s songs. “I got country music with the days first cup of O’boy. And on the weekends, my parents listened to “Lovesick Blues”, “I’m so lonesome I could cry”, “Hey, good lookin”, “Cold cold heart”, “You win again” and “Jambalaya (on the bayou)” . The songs are sung by Patsy Cline, Marty Robbins, Chet Atkins, Jerry Lee Lewis and Elvis Presley. It was a long time before I realized that everyone was written by Hank Williams…. And I feel a little bit the same about this album, but it was nice listening so thanks Trigger. I think the intent of this record was to set the table for Charley, not rocket him onto the national scene. He’s paying dues. His next record will be the big one. You need to see him w his band. It’ll change your mind. Now that’s some good stuff. Looks like it’s another one to add to the “to buy” list. Play list isn’t there anymore?!? It’s back now, but yeah for some reason it wasn’t working for about 10 minutes or so. Might have been a SoundCloud issue. Looking forward to giving album a listen. Had a lot of fun shooting a music video with Charley and Co. last month. They’re a blast and a half to see live. Saw him open for Turnpike. Very talented (although the set dragged a bit). Saw him in the crowd after his set, and he was a genuinely nice guy. Hopefully his next record takes off. I really like his sound. Great band, stood in for Turnpike a few weeks back when they had to cancel. Fantastic show. Talked to a couple of the guys after the show; humble and genuine. Very much looking forward to their original debut, but this album of covers is excellent. This guy is The Real Deal. He’s paid his dues, thrilled to see him getting some press and exposure! I saw him when I went to see the Turnpike Troubadours in Philly. Some of his songs were decent but his set dragged on and on and I eventually tuned him out. Charismatic fellow and pretty funny but his music wasn’t working for the crowd. Crockett’s cover of ‘Ramblin’ Man’ is one of the best I’ve ever heard..really loved the steel infusion. For the record, Steve Young’s cover of the same was my favorite of all time. After hearing Crockett, I am definitely going to purchase his album when its released. Thanks for the introduction to Crockett’s music Trigger.